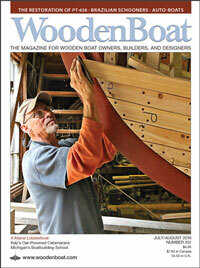 Photographer Tyler Fields wrote and photographed Applying Gold Leaf to Lettering: A modern method to achieve a classic look in WoodenBoat No. 261. 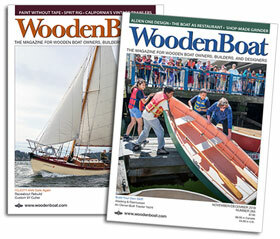 He outlines the step-by-step process wherein professional sign-maker Joan Perkins applied tissue-thin sheets of pure gold to adorn the transom of THIMBLE, a Herreshoff 12½ sailboat. Gold leaf, as a material, comes to the consumer after a fascinating manufacturing process that you can watch below. The footage comes from British Pathé, an impressive and enthralling newsreel archive in London, England, that has converted many of their 85,000 short films to digital versions that are available free to the public through YouTube. This one here was filmed in 1959 at a manufacturer in Ruislip, Middlesex, England, and while we’re sure there might be a few updates to the process, a great deal of the tools and techniques are most likely still employed today. Oftentimes, when I watch a video from British Pathé, I get pulled right into a few more because they’re so engaging. Enjoy, and good luck!